George’s plans to take his new girlfriend Allison to Steinbrenner’s ball to show her off but he finds out that she is planning to break up with him beforehand. 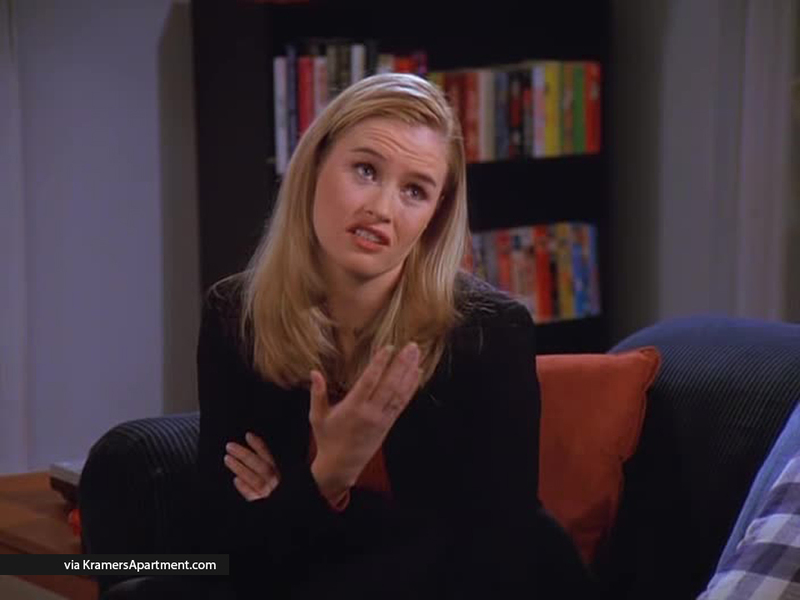 He therefore goes to great lengths to avoid her, saying, “If she can’t find me, she can’t break up with me.” Finally, when she cannot find George to break up with him, she uses Kramer as a go-between and Kramer breaks up with George on her behalf. George: Hey! Uh–listen–did you get your–uh–boss’s Knick ticket, for Kramer? George: Woo! Courtside! Is that the best you could do? Ha ha! Allison: George. We need to talk. Allison: (on phone machine) George? Are you there? I hate that stupid message. I know you’re avoiding me, I’m at the office, please call me, I’ve gotta talk to you. George: Hi, Allison? Oh, I guess you’re not at home.. I probably should ‘ave tried you at the office. Anyway, good to hear from ya, really looking forward to the ball.. (hangs up) Ha ha!